Collective problem: Researchers have long debated the role of common genetic variants, assessed by DNA microarrays, in complex diseases. Individually, common genetic variants confer little risk for autism. But taken together, they may contribute significantly, predicts a statistical analysis published 15 October in Molecular Autism1. Common variants are typically defined as those found in more than five percent of the population, and rare variants as those found in less than one percent. Researchers predict that cumulatively, common variants contribute as much as 40 percent of autism risk in families with one child who has the disorder, and 60 percent in families with more than one affected member. The report is the result of a sophisticated statistical analysis based on data from about 2,000 families. It is the latest contribution to a long-running debate over whether relatively common diseases such as autism stem from rare mutations that individually have large effects, or from a combination of many common variants that each exert small effects. The new finding falls squarely in the middle. Others are skeptical about the magnitude of risk the model predicts, however. The debate over the relative contributions of common and rare variants has been driven in large part by the technologies available. 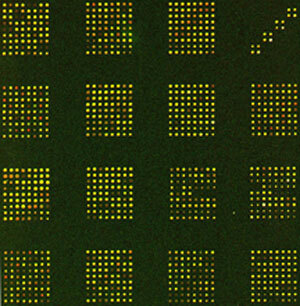 The advent of gene microarrays nearly ten years ago enabled scientists to quickly and cheaply search the genome for common genetic variants, known as single nucleotide polymorphisms, or SNPs. That in turn triggered a flood of genome-wide association studies (GWAS), which are designed to detect common variants that occur more frequently in people with a certain disease than in others. But GWAS approaches to autism have been somewhat disappointing. For example, an analysis published in August of more than 2,700 families who are part of the Autism Genome Project (AGP) found no SNPs that are significantly linked to autism or to symptoms associated with the disorder2. In the new study, rather than look for individual SNPs, Devlin and his collaborators used statistical modeling to determine whether common variants overall contribute to risk. They focused their analysis on GWAS data from two large projects — the AGP, which includes data from multiplex families, in which one or more children are affected, and the Simons Simplex Collection (SSC), a database of families that have a single child with autism and unaffected parents and siblings. The SSC is sponsored by the Simons Foundation, SFARI.org’s parent organization. Altogether, the researchers compared data frommore than 2,000families with a history of autism and 1,600 control individuals. In simplified terms, the researchers used the SNP data to calculate the distant relatedness between everyone in the sample, generating a massive pedigree. “People who are more closely related tend to have autism and those who are more distantly related do not, consistent with the idea that common variation is driving some heritability of disease,” says Andrew Paterson, Canada Research Chair in Genetics of Complex Diseases at the University of Toronto, who was not involved in the study. Rather than debate the relative contributions of common and rare variants, the researchers say it’s time to look at how the two types of variants work together. “As we move forward in sorting this out, it will begin to give us an opportunity to understand the relationship between common variants and rare variants,” says Matthew State, co-director of the Yale Program on Neurogenetics and one of the researchers on the study. Genetic modifiers can influence the outcome of a mutation. For example, rare variants can cause highly variable symptoms, suggesting additional genetic or environmental factors at play. Devlin says common variants may modify the effect of the rare risk variants. Some companies have already begun to market diagnostic tests that predict an individual’s risk of autism based on a set of SNPs. But Devlin says his findings have little clinical relevance. “[Individual] common variants are going to be very difficult to find,” he says. There is also little agreement among the experts over the best way to move forward. Hakonarson favors sequencing DNA from large numbers of individuals with autism — 20,000 to 30,000 — which he says is likely to give a much more accurate estimate of the percentage of risk that can be attributed to common variants. Paterson says larger GWAS are needed, perhaps on the order of tens of thousands. Devlin suggests better analysis of existing SNP data. “There may be smart ways of looking at data where you might be able to eke out some of the common variants without huge sample sizes,” he says.